True ownership of one share of Under Armour stock framed like you want. The recipient becomes a real shareholder of the company. As of Feb. 2016, Under Armour stopped issuing paper stock certificates and registers ownership electronically instead. The recipient still becomes a real shareholder of Under Armour Inc. with all associated rights. 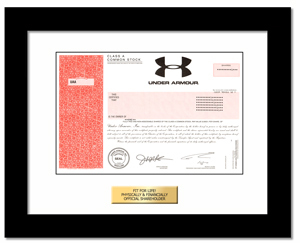 The Under Armour replica stock certificate is strikingly ornate. It represents a snapshot of history incorporating the company's name, logo, corporate seal, and printed signatures of corporate officers. Under Armour is the originator of performance apparel - gear engineered to keep athletes cool, dry and light throughout the course of a game, practice or workout. This is the Class A voting stock.